Smoky Park Supper Club in Asheville, N.C., is constructed from 19 containers. 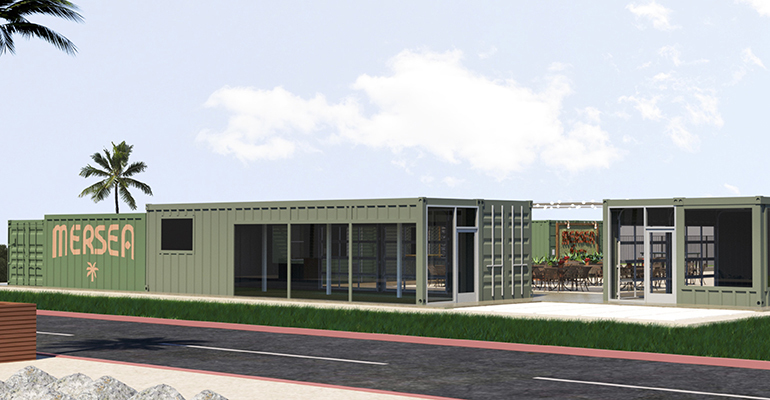 When Mersea opens later this fall on San Francisco’s Treasure Island, the restaurant and bar with an elevated comfort-food menu and panoramic views of the city’s skyline will be built entirely out of recycled shipping containers. The innovative restaurant is a partnership between Parke Ulrich, executive chef of San Francisco waterfront restaurants Waterbar and Epic Steak, and co-founder MeeSun Boice, a self-described foodie with a background in various technology sectors. While Ulrich is a veteran of the restaurant industry, Mersea — derived from an Old English word meaning “island oasis” — is Boice’s first foray into the business. The restaurant and bar, which will offer an elevated comfort-food menu and panoramic views of the San Francisco's skyline, will be built entirely out of recycled shipping containers. Ulrich and Boice, a regular at Waterbar and Epic Steak since moving to the Bay Area in 2010, became fast friends over their shared love of food and the sea. Their connection to Treasure Island — a small, artificial landmass that was the site of the 1939 World’s Fair and a U.S. naval base that is currently being developed into a new community — began five years ago, when they both became involved at the volunteer Treasure Island Yacht Club. It was through their involvement with the club that they learned about the opportunity to open a restaurant on the island. 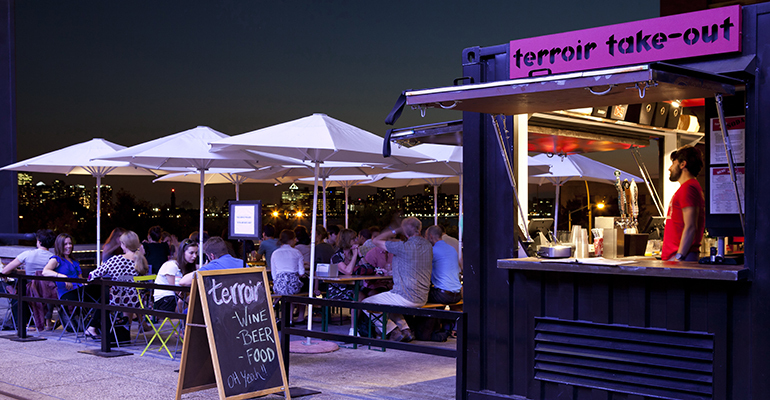 The idea to use shipping containers for the restaurant emerged out of the need for the space to be somewhat temporary, as the entire island is essentially under construction. In recent years, the desire for sustainability, moveability or just interesting design has driven the use of shipping containers for a variety of concepts. Created by Mavrik Studios, the design employs recycled industrial shipping containers to create an indoor dining space that seats 60 people, a kitchen, restrooms and private dining spaces. 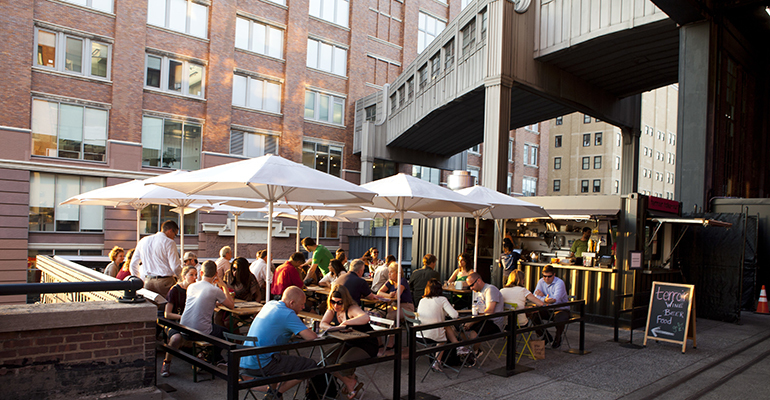 Outside, facing the interior of the island, the containers form a U-shaped patio area with another 60 seats. Floor-to-ceiling windows connect the indoor and outdoor spaces and provide views over the island’s San Francisco-facing Great Lawn. “On a clear day, you can see all four bridges—the Bay Bridge, the Golden Gate Bridge, the Richmond Bridge and the Bay Bridge span to Oakland,” Boice said. Diners — everyone from residents and commuters to construction workers and developers — will be able to order at a counter from a menu featuring cuisines representing the cultural diversity of the Bay Area and have the food delivered to their tables. The still-developing island has proven to create many challenges for the duo, from how to block harsh winds while still offering spectacular views, to bringing in all utilities, including electric, water and cable. “Everything was a little bit challenging,” Ulrich said. 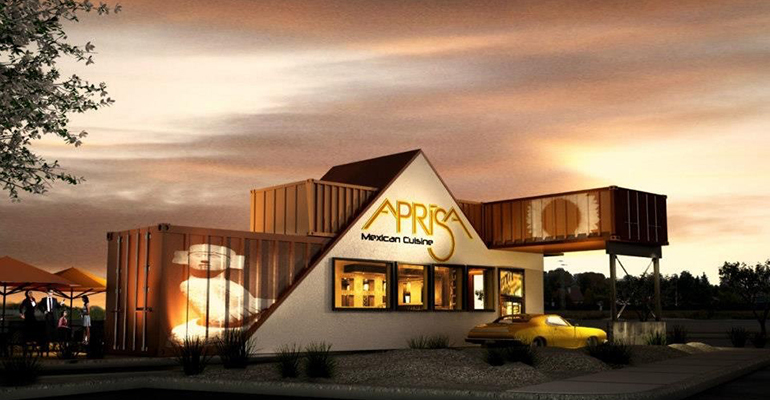 Aprisa in Portland, Ore., is a quick-service Mexican concept inside a recycled shipping container. But he was up for it. His menu is informed by the island’s limitations, such as the all-electric industrial appliances in the military-grade kitchen container designed to serve thousands of people a day. Ulrich said he’ll use the kitchen’s 20-gallon stockpot to make soups, such as chicken matzo ball, clam chowder and ramen, as well as stocks. A flat-top griddle will be used to make an array of sandwiches, such as pork roll and egg sandwich with kimchi, aioli and arugula; double-stacked Wagyu cheeseburger; and tuna melt. Open for breakfast, lunch and dinner seven days a week, the menu will also feature an assortment of breakfast items, salads, seafood favorites, snacks and desserts. This sandwich and charcuterie restaurant and bar in the Downtown Container Park in a Las Vegas, is made from two shipping containers. While the island already has a cafe that serves breakfast, lunch and catered events, as well as some food trucks, distilleries, breweries and a market with a deli counter, Boice said there are very few options for a quality sit-down meal, especially at dinnertime. In addition to providing comfort food, Ulrich and Boice have partnered with the Treasure Island Homeless Development Initiative and its member organizations Toolworks and Bakeworks to provide job training and job opportunities for people in the community with barriers to employment.